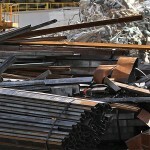 Scrap metal theft is a common occurrence in many areas, but Ferrous Processing & Trading is taking steps to prevent it. Ferrous Processing & Trading is working with the scrap metal recycling industry to help reduce metal theft. The massive surge of stolen items includes copper wire, aluminum bleachers, air conditioning parts, automotive parts, and even industrial building materials such as railway ties or steel construction pieces. Thieves have been known to tear down utility poles for the copper inside. When this happens, they leave thousands of dollars of damage in behind. Furthermore, these kinds of crimes cause electric service disruptions or the risk of electrocution from damaged lines which can become a public concern. Scrap metal that is stolen is nearly impossible to identify when it is taken in to a scrap metal processing center. Scrap metal often changes hands many times before it is sold to a scrap metal recycling company and is untraceable. It can also be disguised or damaged reduce the signs of theft. Companies like Ferrous Processing and Trading are committed to following the strictest regulations regarding scrap metal processing to help deter metal thieves; at FPT’s scrap metal recycling facilities, scrap metal suppliers are required to provide the necessary identification as outlined by the law and industry best practices. Many of the measures that are being suggested by lawmakers to curtail the thefts are already standard procedure for businesses owners like Anthony Soave. For instance, one option currently offered at Ferrous Processing and Trading is that rather than cash, sellers are issued ATM-type cards that can be used at on-site machines. Hopefully efforts like this will continue to deter thieves and keep the metal industry healthy. Ferrous Processing & Trading is a key supplier to the metals industry of North America. From every stage of the metal recycling process from the assembly line to the used parts pile then through the scrap processing yard and into the furnace, FPT has the right answers for handling and marketing metal.